After 20 years of service its time is up, but due to its plutonium power source Cassini can’t be left to find its own final destination. Before its September demise it will weave through Saturn’s rings making yet more observations. Cassini has used a gravitational slingshot around Saturn’s moon Titan to put it on a path towards destruction, reports BBC News. Saturday’s flyby swept the probe into an orbit that takes it in between the planet’s rings and its atmosphere. This gap-run gives the satellite the chance finally to work out the length of a day on Saturn, and to determine the age of its stunning rings. But the manoeuvre means also that it cannot escape a fiery plunge into Saturn’s clouds in September. 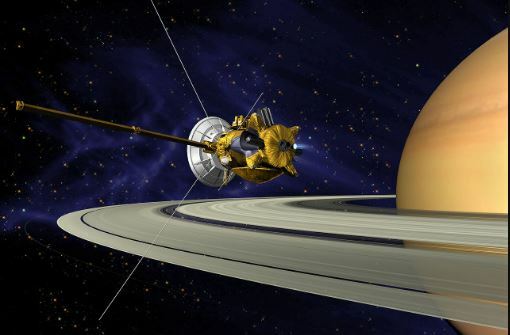 The US space agency (Nasa) is calling an end to 12 years of exploration and discovery at Saturn because the probe’s propellant tanks are all but empty. Controllers cannot risk an unresponsive satellite one day crashing into – and contaminating – the gas giant’s potentially life-supporting moons, and so they have opted for a strategy that guarantees safe disposal. “If Cassini runs out of fuel it would be uncontrolled and the possibility that it could crash-land on the moons of Titan and/or Enceladus are unacceptably high,” said Dr Earl Maize, Nasa’s Cassini programme manager. “We could put it into a very long orbit far from Saturn but the science return from that would be nowhere near as good as what we’re about to do,” he told BBC News. What will space exploration look like in 2040? If Cassini survives this first round, it will make 21 more crossings before its demise in September. The gap between Saturn’s atmosphere and its rings is relatively narrow: 1,200 miles, or 1,900 kilometers. “We’re all crossing our fingers saying, ‘Oh, geez, I hope we hear from it’—and we will,” added guidance and control engineer Joan Stupik.